Tumblr(.com) is a cool blogging service. It allows quick blog posting with easy to use tools and interface. 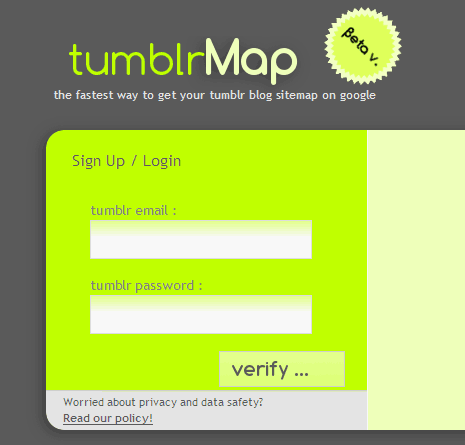 If you are not too impressed with indexing of your Tumblr blog, then tryout tumblrMap. This web service automatically generates XML sitemap of your tumblr blog and allows direct submission to Google for indexing. To get started, login using existing tumblr account (yeah, no seperate account creation!). Select either of blog in your Tumblr account and preview the XML sitemap of your blog. Add quick meta tag to your tumblr blog and submit it to Google for quick indexing. By default Tumblr does provide sitemap for your blog but this service make sitemap creation and submission very easy. Technical aspects of blog like sitemap are not easily digestible by ever user. It can build sitemap twice a day with option for on-request sitemap rebuild and Google ping. Get your Tumblr blog optimized for Google using Tumblr Map, interested? Tumblr Map site is not working? Anyone knows how to change date of items in tumblr blog sitemap? tumblrmap is not working anymore.. is there any option to create a sitemap for tumblr?? I tried using this service, but even afte a week, my site is not indexe. Any ideas? Any updates to your post.? Read this article (tumblelog.jauderho.com/post/122434303/4-tumblr-seo-tips) and apply the code in your blog. You will see how your site gets indexed. I also recommend you to use your own URL instead of tumblr’s and submit it manually to the search engines. You will find where to in the same article. I was also looking for such a tool ! Thank you ! Thank you very much, been looking for a Tool like that as Google regarded my sitemaps for tumlr faulty all the time.